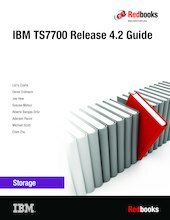 This IBM® Redbooks® publication covers IBM TS7700 R4.2. The IBM TS7700 is part of a family of IBM Enterprise tape products. This book is intended for system architects and storage administrators who want to integrate their storage systems for optimal operation. Building on over 20 years of virtual tape experience, the TS7760 now supports the ability to store virtual tape volumes in an object store. The TS7700 has supported off loading to physical tape for over two decades. Off loading to physical tape behind a TS7700 is utilized by hundreds of organizations around the world. Using the same hierarchical storage techniques, the TS7700 can also off load to object storage. Given object storage is cloud based and accessible from different regions, the TS7760 Cloud Storage Tier support essentially allows the cloud to be an extension of the grid. As of the release of this document, the TS7760C supports the ability to off load to IBM Cloud Object Storage as well as Amazon S3. The TS7760T writes data by policy to physical tape through attachment to high-capacity, high-performance IBM TS1150 and IBM TS1140 tape drives installed in an IBM TS4500 or TS3500 tape library. The TS7760 models are based on high-performance and redundant IBM POWER8® technology. They provide improved performance for most IBM Z tape workloads when compared to the previous generations of IBM TS7700. Legal disclaimers :IBM Cloud Object Storage Free-Tier promotion expires 12 months after your initial sign up. Standard rates apply for usage beyond 25 GB, 20,000 GET requests and 2,000 PUT requests per month. Free-Tier applies a maximum non-refundable monetary credit equivalent to the value of said services against your monthly statement. Please see product detail page for full, standard pricing details.